BlytheLife.com » Smidge House Sofa Giveaway: The Winner! Thank you so much to Carmen of Smidge House for sponsoring another fantastic giveaway here at BlytheLife.com. There were a lot of entries (87 in total!). Thank you so much to everyone who commented, tweeted, followed and blogged their entries! Now I’m sure you’re all wondering who won that great sofa and those two absolutely adorable cushions (I wish I had cushions like that for *me*!). Congratulations to Christin! Your email address has been sent to Carmen and she’ll be in touch with you! Omg thank you so much I can’t believe it!!!! 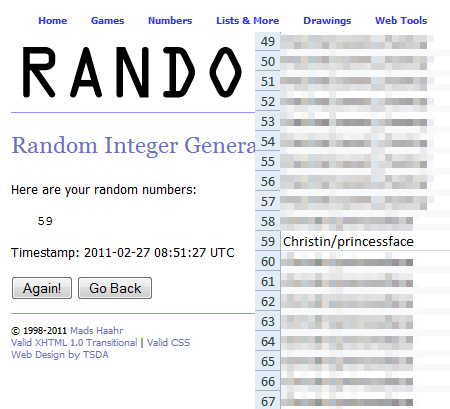 Congrats, Christin! 🙂 Thanks so much, everyone, for entering and for all your amazing compliments! You all just made my week!